We are an independently-funded charity which receives no government or NHS funding. We fundraise on a continuous basis to keep our doors open and ensure our patients never miss a screening. There are many ways to support our work and be part of our mission to help people feel better with film. These include fundraising, such as by running the Virgin London Marathon; encouraging your place of work to become a corporate partner, such as by nominating us to be the charity of the year; and giving a regular donation, which enables us to plan with more certainty. MediCinema has charity places for various challenge events, including the Virgin London Marathon and Royal Parks Half Marathon. We have a team of Kiltwalkers every year and are always happy to hear from people taking on other challenge events, such as Tough Mudder or the Serpentine Swim. Alternatively, why not run your own fundraising event, such as a bake sale or film pub quiz. We're always looking for ways to raise awareness and funds for MediCinema so if you have a great idea that you think might help us please get in touch. Whether your company's CSR programme has a local or national focus, we provide a unique opportunity to be part of a national campaign that brings an invaluable service and cinematic experience to hospitals and places of care. We will work closely with you to develop and support your fundraising plans, be it a one-off event or a long-term partnership, and will help identify PR opportunities that support your brand values while inspiring your employees and clients. Get in touch for more information. Would you like to be part of the MediCinema family? 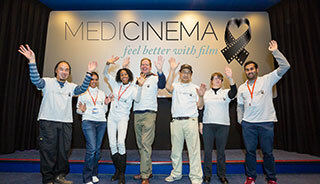 MediCinema volunteers are vital members of the team, giving their commitment, time and energy on a regular basis. We have a dedicated team of volunteers who assist at each screening and are primarily responsible for collecting patients from the ward and assisting them to the MediCinema, pushing wheelchairs and hospital beds as required, then returning them to their ward once the film is over. 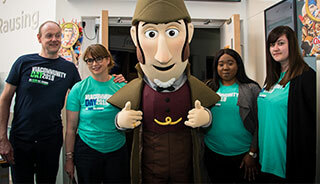 The role of our cinema volunteers is vital: without them many of our patients wouldn't be able to make it down, plus patients are often nervous about leaving the ward so our volunteers chat to them to put them at ease. If you are looking for a role that brings immediate benefit and pleasure to patients, one that enables you to see the real difference you’re making to their lives, then volunteering at the screenings could be for you. We ask these volunteers to commit to two screenings a month for a minimum of a year. Volunteers need to be aged 16+ at our CW+ MediCinema in Chelsea and Westminster Hospital and 18+ at all our other sites. We also have many volunteers who donate their time in lots of other ways, such as helping out at our head office or sharing professional expertise and skills to enhance our work . Many volunteers choose to support our fundraising - organising events, being part of our gala committees or bringing in key contacts who may be interested in supporting MediCinema directly or through their company. However you would like to help, we would love to hear from you, so please get in touch for more information. I have been a volunteer at MediCinema for over three years now and have enjoyed every minute of my time so far. The main reason I became a volunteer was I wanted to give something back as I know myself what it is like to stay in hospital for long periods of time. I joined MediCinema as I think it provides the best form of escapism for children, young people and adults who are in hospital, through the power of film, and makes them forget for a while that they are in hospital with illnesses. It makes me happy to see them enjoy brand new screenings and, being able to talk to them about the films and to see how upbeat and more positive they are after experiencing it – it shows me what it means to them. I work with a great team and have made new friends. We do our best to make sure all of the people have a great time. It is hard not to understand the value in the work MediCinema does, personally to me it is very rewarding to help others and is worth it to see the smiles, joy and laughter that MediCinema can bring and the special experiences and memories that are created, not just for the patients, but also for the parents, relatives and volunteers. This is why I continue to volunteer for MediCinema and would recommend it to anyone who has a bit of spare time on their hands. Volunteering for MediCinema, it’s clear how much patients enjoy being taken to the cinema for a couple of hours. It’s a change of scenery and something new to think about. Some of MediCinema’s visitors are very ill, or have been away from home for weeks, but more often than not they are grinning on their way out at the end of the night. That’s the power of cinema. It doesn’t take much to give up a couple of evenings a month to help out, but it makes a huge difference to the patients, and their friends and family who often come along for the movie. And it’s not just them who get something out of it. I spend a lot of time on my own with a computer screen for work. Coming along to MediCinema is a change for me too. If work is difficult, life feels stressful or I’ve had a bad day, it gives me a sense of perspective and I leave with a smile on my face too. For patients, the chance to ‘escape’ from hospital, even for a couple of hours, has a huge impact on their stay in hospital, and I have seen this first hand. It really is a great volunteering job! Would you like access to exclusive red carpet events in London and the UK? MediCinema is very fortunate to be supported by the UK film industry with charity ticket allocations to some of the most exciting premieres and film events! 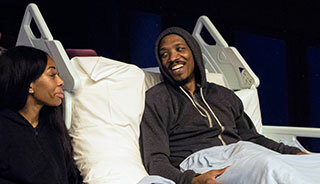 ‘Selling’ these tickets in exchange for a donation enable us to raise vital funds for our work, with a pair of tickets typically enabling us to give 18 patients the chance to escape their ward and find a sense of normality and relief. Subscribe to our mailing list to find out how you can secure tickets - and help us raise vital funds to support our work! Thank you for supporting MediCinema’s Red Carpet Club. Please ensure you read and observe the following terms and conditions. 1. Premiere and preview tickets are generally not available to the public; each event price is set and agreed with film distributors individually. 2. Tickets are non-transferable and non-refundable and subject to availability. Prices will vary. 3. Should MediCinema discover you selling on tickets through any channels (e.g. eBay/Facebook/Twitter), your membership will be rescinded and your name removed from our mailing list. The respective film distributor will be informed, legal proceedings may follow. 4. Due to exclusivity, we cannot guarantee tickets for every scheduled premiere or red carpet event. We cannot accept individual requests for tickets. We will always endeavour to give members as much notice as possible of available tickets, however we frequently receive tickets at very short notice. 5. Spaces are limited and tickets are always allocated on a first come, first serve basis or for larger premieres, in a ballot using an independent draw service. Should you cancel your attendance to an event or fail to attend for any reason without providing sufficient notice or explanation, MediCinema reserves the right to refuse a refund or require any payments due for the event to be paid in full. 6. Red Carpet Club members have no right or authority to organise or promote events that are offered through the Red Carpet Club unless agreed with MediCinema. MediCinema reserves the right at all times to suspend or expel members, or to prevent for any reason a member from participating in Red Carpet Club events. 7. All proceeds raised from our allocated charity tickets go to MediCinema. Registered Charity in England and Wales No. 1058197. Registered in Scotland No. SC039704. 8. The price stated above is for one (1) ticket to the upcoming premiere in London, due to take place on the Xth XXXX 2015, and you can reserve a maximum of 4 tickets. Does not include talent meet and greet or similar. Tickets must be collected on the day of the premiere no later than 6pm at a prearranged venue. Tickets cannot be resold, any entrance tickets resold will be invalid. If you have reserved more than 1 ticket, you must be parent/guardian to any of your guests that are under 18 years of age, all attendees must be the appropriate age of the film. Any costs incurred in addition to the Premiere Screening elements listed above are at your and/or your guests own expense, including but not limited to travel, accommodation, meals, refreshments. Have you or a loved one enjoyed a trip to MediCinema? Stories change minds – in a recent referendum, almost half the ‘yes’ voters said they were influenced by personal stories in the media, and sharing your story is the most powerful way of explaining what we do, why it’s important and the real difference it makes. If you'd like to share your story and help us raise vital funds for our screenings please get in touch we’d love to hear from you.